Generate ores in your world for future use by other mods. Control how they generate, even regenerate ores in your existing world. 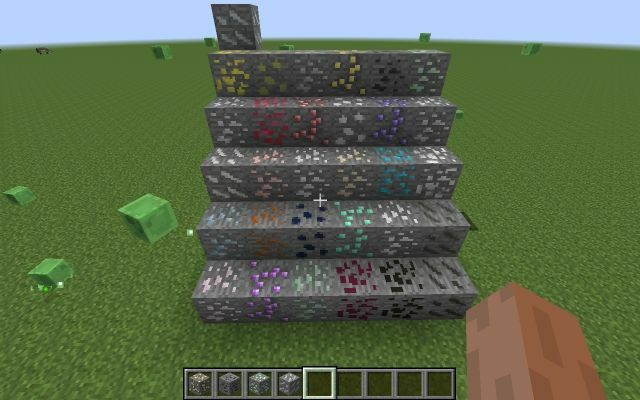 The ores this mod adds don't actually do anything on their own. You need other mods to utilize the ores. This is an Beta release. I am not responsible for lost or corrupt worlds. Be sure to back up any existing worlds before running. Especially if regenerating ores. Please fix the grinder bugs and make armor for all the metals. Using latest version (0.7.40). No crashes or error messages. Though I'm having problems with the cracker and the grinder. Neither machine seems to function. I can put coal and ores into the grinder and the machine will use the coal. No animations of burning are visible and nothing happens to the ores. The cracker will not use any fuel and the bitumen will be left unaltered. Apart from that the mod looks good.